I’m a pretty easy-going fellow, I don’t obsess about things and I’m quite modest… Just ask my wife. All things considered, I do have some standards when it comes to writing instruments however. For example, if you are looking for a cheap, unpretentious pen, you can do no wrong with a ubiquitous Mont Blanc Meisterstück. Whenever I look for fine writing instruments, I prefer to buy pens and pencils made in either Germany or Japan. The attention to detail and excellent manufacturing mechanisms in place in those two countries mean that you get a superior product every time. 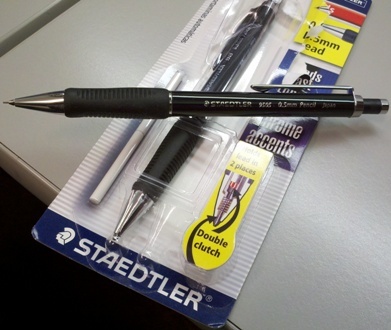 When you buy a pencil from a German company, manufactured in Japan, it’s pretty much guaranteed that writing bliss is only moments away: the Staedtler Integrity 9505 mechanical pencil is a case in point.